President Donald Trump has signed two new executive orders, boosting historically black colleges and rolling back environmental protections created under the previous administration. He also signed two bills that aim to increase the presence of women in STEM fields. On the last day of Black History Month, Trump signed an executive order that will move the Historically Black Colleges and Universities (HBCUs) initiative from the Department of Education’s purview back to the White House. The initiative will now be led by a person “who reports to a senior advisor to the president.” One of its goals will be to promote HBCUs as “strategic partners” in the president’s “urban agenda of creating jobs and making inner cities safe again,” a senior White House official told reporters in a background briefing. It could take well more than a year for the directive and its subsequent rulemaking to be carried out, the Washington Post reported. The executive order pits the agricultural, construction and real estate industries ‒ who complained that the old rule would stifle economic growth and intrude on property owners’ rights ‒ against outdoor recreation and environmental groups, who said the previous protections were essential to safeguard public drinking water and the ecosystems of about 60 percent of the country’s waterways. 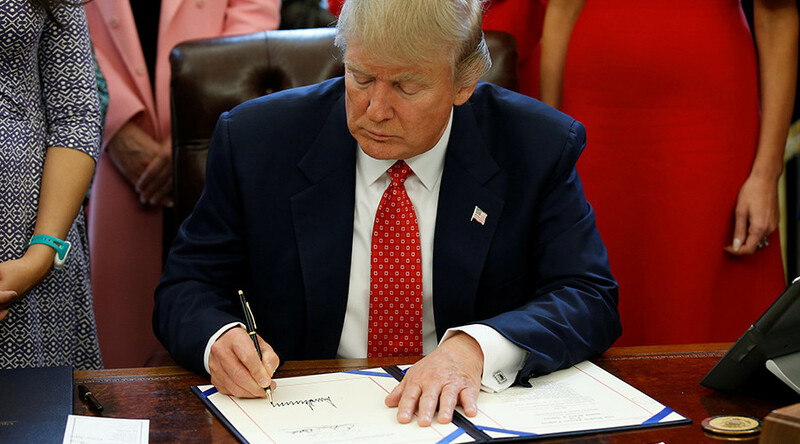 Trump also signed two bills into law that aim to encourage women to go into the fields of science, technology, engineering and mathematics (STEM). HR 321, the INSPIRE Women Act, directs the head of NASA to encourage female students to study and pursue STEM careers, while HR 255, the Promoting Women in Entrepreneurship Act, encourages the National Science Foundation to support entrepreneurial programs for women in those fields. A bipartisan group of lawmakers, including Senators Joni Ernst (R-Iowa) and Heidi Heitkamp (D-North Dakota), were on hand, as were Pence, DeVos, First Lady Melania Trump and First Daughter Ivanka Trump.